Have you met the Perpetually Purple Pack? Running with the pack runs in the family. Yes, they’re related by blood, but purple pride is the real tie that binds. And they wear it on their sleeves. And socks. And probably underwear too. Sound familiar? 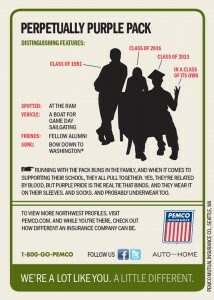 To celebrate our partnership, PEMCO created Northwest Profile #1861 to celebrate you—the unique UW alum! Click trading cards to enlarge. As a proud proponent of higher education, the UWAA is pleased to partner with a like-minded local institution — PEMCO Insurance. Founded by an educator and devoted to education advocacy in the Northwest, PEMCO Insurance is the natural choice as UWAA’s preferred insurance provider. 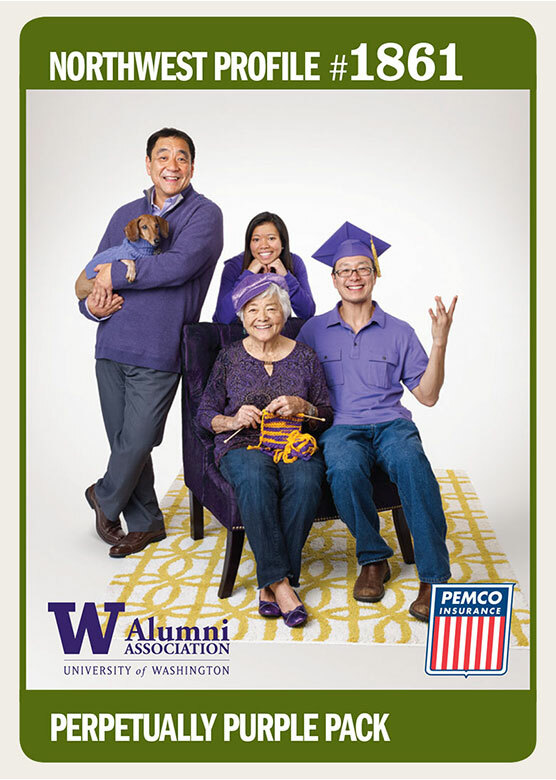 Through this partnership, PEMCO Insurance is offering an exclusive insurance discount of up to 3% on home and auto policies to UW alumni who live in Washington and Oregon. Signing up is simple: All you need to do is mention you’re a UW graduate when you get your policy. Take advantage of the UWAA’s special partnership with PEMCO Insurance today.